Calibration is one of the most important aspects when we are engaged directly or indirectly in manufacturing a certain product in terms of measurements. Almost all of the industries require this service mainly because of quality and safety (and of course including auditor’s requirement). Because of this, Internal calibration laboratory is mostly established and many calibration laboratories exist to provide their services. Calibration service allocates a significant amount of a company’s budget and therefore it is a big plus if you consider having an internal calibration laboratory also called in-house calibration to be implemented. In this topic, I will share my knowledge regarding the elements of an internal calibration laboratory. You will discover the needs or requirements in order to implement a calibration system within your company. Requirements based on company set up, customer needs and or auditor requirements based on a given standard ( usually ISO 9001 or ISO 17025) are some factors that determine our process. A basic Calibration process flow is also presented. 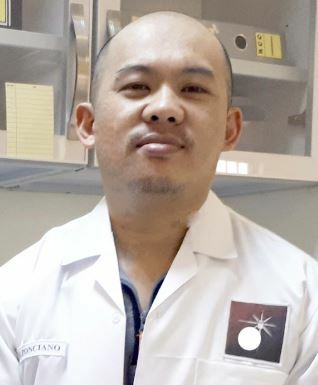 This is not a guarantee to be complete but, this is a good starting point to understand and implement your internal laboratory calibration system. 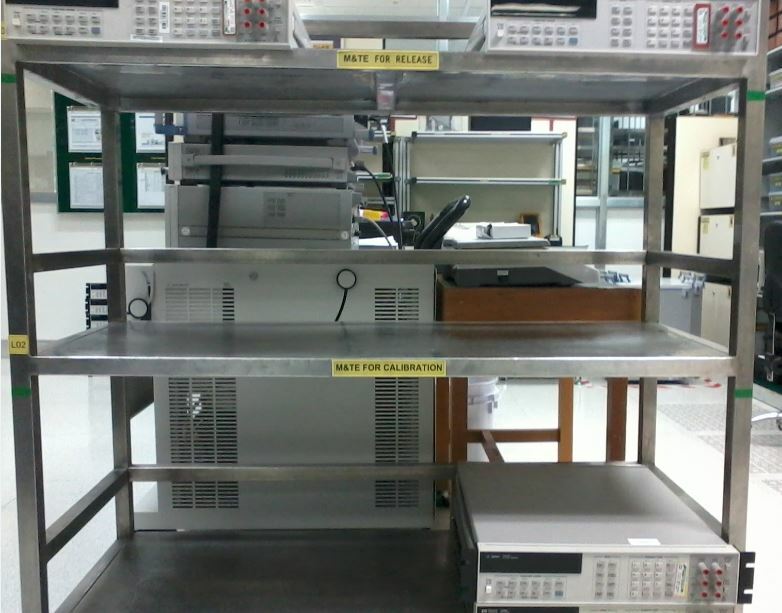 What are the benefits of Implementing an In-house Calibration Lab? What is In-house calibration? Basically, it is a calibration system performed or established inside a company’s facility. This is to differentiate it to an external laboratory which is a third-party laboratory. A third party laboratory also has an in-house calibration but in this article, we will concentrate on the company established calibration. In-house calibration lab executes its own calibration system based on a verified and accepted calibration procedures using traceable reference standard. If you have a lot of measuring equipment for calibration, you will save a significant amount of money (in terms of calibration from an outside source and logistics in the long run). .To verify whether you made the right choice in purchasing a standard, do justification to compare how much you will spend with a single standard in comparison with how much you will pay for a calibration service with the related measurement equipment. See this link for a sample justification. You will save time in calibration downtime because you do not need to send your instruments to an outside lab. Customers have more trust in your performance in terms of monitoring of measurement process. More capabilities in terms of measurement will be explored. The possibility of providing calibration support to other locations or departments. Centralize execution of calibration, better monitoring. 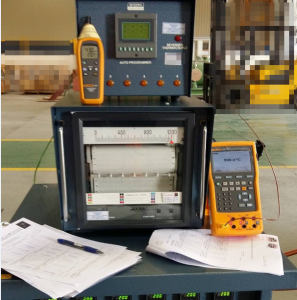 I observed that some companies have their equipment monitored as per department or by the person who utilizes the instruments, it is also their choice of whom they choose to provide calibration service. Non-Conforming calibration can be detected immediately, therefore, can be isolated or process affected can be informed immediately for proper assessment and disposition of affected product. Reduces the risk of vibrations or other environmental stress that it absorbs during transport thus, increased assurance of stability. You need to manage a Quality System with wider calibration laboratory processes which include generation and maintenance of calibration procedure, calibration certificates, preparation for a customer audit, audit support to the various area of the industry and more. A master standard or reference standards are required to be purchased which also needs maintenance and calibration on a given period. Competent calibration personnel is needed which includes continues training ( and a laboratory facility). 12 Elements for the implementation of the Calibration Program in an Internal Laboratory. Before we start our calibration project, it is important to consider first what is our calibration scope. This is where we can determine our capability of how wide our services can reach and what instruments we can calibrate. This is why we exist as an internal calibration lab. We will mention here about the parameters that we can calibrate or calibration service we can provide, the reference standards that we are using and the reference procedure or methods including reference guides. ABC lab exists to provide a traceable calibration of measuring and test equipment under Dimensional, Pressure, and Electrical that can directly or indirectly affect the quality of our products. The table below details the scope of capabilities and reference standard used. I am sure before we start sending our instruments to an outside calibration lab, we already have a list of our measuring instruments. If we have, this list is now our master list for our internal calibration laboratory (if you do not have, you should create one, take inventory of all the instruments for calibration). It should include all the details of measuring instruments. This is now our starting point, we have now our inventory, we should determine where they are, who owns the instruments and other details regarding the instruments like the calibration history file. During this time, also take the time to put proper coding. This is now our monitoring tool. ( in my past company, we have a database- the METCAL from Fluke which automates documentation and monitoring including the generation of calibration certificates). The Measurements Data Sheet (MDS) – Record Your Result! You should have a form where your results and observations will be placed. I call this form a Measurement Data Sheet ( MDS). Others call it Measurement Data record, Calibration record, or calibration worksheet. Why? Of course, to record and document your calibration execution. But another important reason is that to have proper traceability regarding the performance, not just the execution but all the elements of the calibration system. Just in case a problem arises regarding the instrument, we can easily trace back who perform the calibration and what procedure has been applied and what data has been recorded etc. Note that applicable Document Control and Records Control applies to all calibration procedures and forms used and other documents that are part of the calibration system. 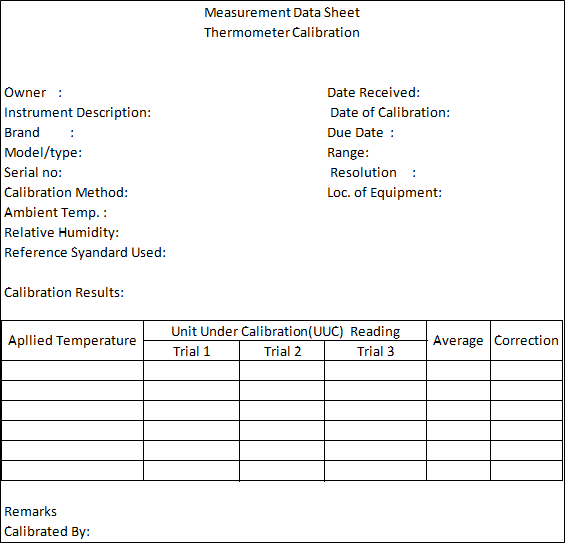 Once the data sheet is completed, you can convert it to a Calibration Certificate with almost the same but some added details and more presentable with the title Calibration Certificate ( to be more formal and adequate, it should be align with the requirements based on ISO/IEC 17025:2005, General requirements for the competence of testing and calibration laboratories ). To view the ISO 17025 calibration certificate requirements and tips to properly review and interpret the requirements of a calibration certificate, visit this link. Calibration system should detect and provide correction to any deficiencies related to calibration. A documented system that monitors and control all measuring and test devices used in manufacturing a product, used in quality control or inspection operations to ensure conformance at given specifications or requirements. Once we determine our scope, we will now specify what is the flow of our calibration process, how we can execute the calibration job starting from collecting of the UUC to releasing of UUC with calibration certificates. We will not just receive an instrument then calibrate it immediately. We should have our first step before we proceed for calibration. Every step of a calibration process should be clear to us in order to have a smooth and documented execution. In order to execute the internal laboratory calibration process properly and to have a clear view, below is a calibration process flow (or a plan) that I implement. You may change it depending on your needs but the steps or requirements should be maintained or more if necessary. The calibration process presented above is the simplest, we did not consider to put other factors like what if we are not capable in calibrating a certain UUC, what if newly calibrated with an existing calibration certificate or totally damaged equipment? These questions are usually tackled or solved by considering an additional process, but for simplicity, we will maintain it as is for the sake of this presentation. Since we already have the master list, we can notify the owner and wait for them to submit the instruments or go to them, it is up to the agreement. During this time, just make sure that all instruments that are due for calibration will be collected. 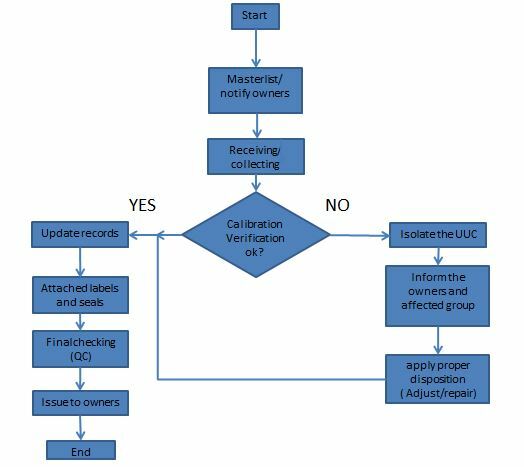 During receiving, make sure that all details are accounted for, check the status of the Unit Under Calibration (UUC), (this is how we will call here instruments for calibration). Check for any defect and some requirements they need. (you need to have a form for this). And let them sign for formality and that they acknowledge that they are the responsible owner of the UUC. If the organization is small and only one or two persons is handling the instruments or UUC, this is no longer a problem to think but be sure to have complete monitoring of all the instruments under you. Once you already receive the UUC, place them to a designated storage area, see to it that they are protected and with proper separation, label or put a tag to ensure proper identification. Do not remove tag while it is still for calibration or inside the lab to ensure monitoring of status, also observe proper handling when transferring. Check also your storage area, see to it that UUC is protected from any environmental effects such as temperature, humidity or electrostatic discharges. This stage is where we determine all the requirements related to the actual calibration of UUC. After inspecting the received UUC, we will now determine how we can execute the calibration job. Just ensure that a generated calibration procedure are validated, meaning you have tested to be fit for the required instruments and of course, should be properly documented. Below are the contents that we should consider in generating a calibration procedure (as a minimum). The uncertainty of measurements (when required) – this is mostly required for an external accredited laboratory, but if you can implement in your procedure, it is a big factor where some auditors are asking for this so better we include it. Since it is a controlled document we should not forget to include the Author, revision number, a unique code for this procedure, the revision history and more depending on the format in which your doc control requires you to add. Also, this generated procedure is required to be reviewed once a year or as necessary to ensure the use of an updated one. Calibration labels should be clearly visible when attached. 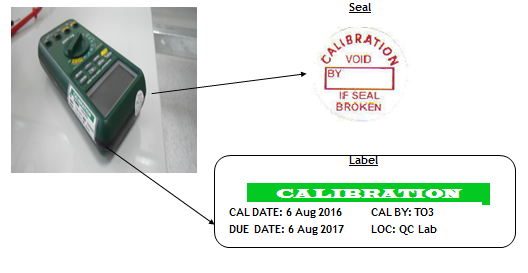 There are times when a UUC has a limited calibration or a calibration is not required, this type of label should be included. But make sure that there are proper assessment and documentation. Also, regarding the UUC with has a smaller size where it is impractical to put the sticker, we can place it in its box or container. It is also required to put a tamper-proof seal to protect the newly calibrated UUC from any unauthorized adjustments that can invalidate the calibration settings. Once a calibrated Instruments was returned back to the owner or released to be used again, you should have a recall system to get it back once it is due for calibration ( this is applicable to a very large organization where too many owners are scattered per department or area). This is one of the most difficult parts, where some owners do not care about their measuring equipment unless they are being caught in an audit. One best practice to do is to copy their bosses together with the quality team in the email then directly address them during follow up. Also, you can make some kind of a penalty for being overdue. Reference Standards are the equipment we used to calibrate UUC, we compare and verify the accuracy of the UUC with respect to these reference standards. It has the capabilities of accuracy, stability, range, and resolution for the intended use. As much as possible at least 4 times more accurate than UUC to be calibrated. Environmental factors like Temperature and Humidity have a great impact on the calibration job. Whenever an environmental condition is not met, the calibration job should be stopped until it returns back to normal. Normal wherein a required temperature and humidity range that is prescribed is within the specified range. Since it is critical in our process, it advisable to use a continues recorder, a Thermo-hygrometer, to monitor and record. please check this link in my previous post about this topic. All personnel (calibration technician or engineer) that performs calibration should have proper training, in short, should be competent enough where he can demonstrate the required calibration procedure when prompted. They must have attended or be oriented regarding calibration awareness as the first part of the training or exposure to calibration basics. Calibration awareness is one of the most important training that an organization should take regardless of the area you are in ( like in production, planning, purchasing, and others). Of course, this is under quality surveillance. Their competency is supported by their qualifications ( experience, education, training, etc). Moreover, all of his training must be included in a record control file for proper monitoring. Data retention is important for every records control procedure, in calibration, data retention is very meaningful. Compare to other records, calibration records should be accessible easily even it is an old record, we need to collect and tabulate data specifically the data of reference standards for our history file. This will provide a reference regarding the performance of a certain instrument, past data will help you to decide on how you adjust or provide a proper disposition specifically in determining the calibration interval of your instrument. Usually, records retention is 5 years or longer. What Quality Controls should be implemented to ensure the reliability of the reference standards used? Reference standards are always used for measurement either inside the laboratory or outside the lab (on-site calibration). It is exposed to different environments and handling of personnel. Because of these factors, we must ensure that our reference standards are still in good conditions outside and inside. How to Handle out of tolerance calibration results? What to prepare during customer audits/internal audits? 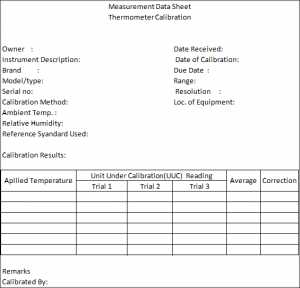 How to determine the calibration intervals? What will you do if you have a lot of overdue for calibration? A smooth flow of operations is the result of a planned and documented calibration system, there should be a continuous improvement of every aspect to adapt to the ever-changing requirements and needs. Thank you for visiting my site, please leave a comment and subscribe. 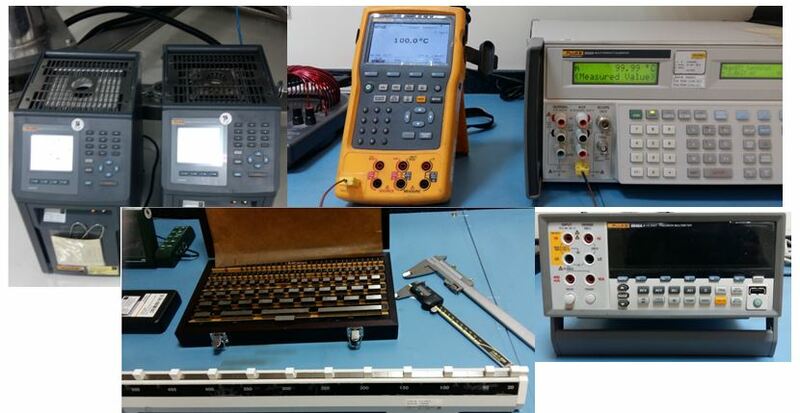 Can you talk about BS50504 standard for calibration of welding machines. Yes, I will consider if i have the resources. do you have a copy of the BS 50504 standard? You are welcome. I am very happy knowing that you are using this post as a guide. Hope that it can help you in more ways. I would be glad to know the outcome of your calibration journey in establishing your Internal Calibration Lab. Please do not hesitate to provide more feedback. Thanks you very much sir for the post. You are welcome. Thank you for reading my post. Please feel free to comment for any related concerns. You are welcome. Thank you for reading my post.